KH-400 Heat sealed outer envelope machine for packing pyramid teabags. KH400 outer envelope machine is designed for packing pyramid teabags into envelopes. 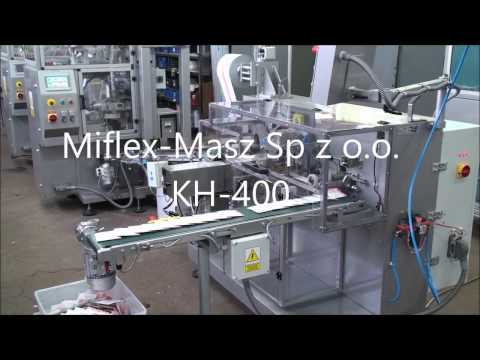 It is designed for cooperation with Miflex-Masz’s APO-11P pyramid teabags packing machine. It can use for working with others pyramid teabags packing machines also. This machine is equipped with conveyor for transfer teabags pyramid from pyramid packing machine and collecting envelopes conveyor. Then you pack flavoured and good quality tea blends, aromatic herbs or pharmaceutical infusion you are in a position to protect aroma thanks to heat sealed outer envelope.